When you have your own home or business, you have to look into several different aspects of indoor decor. You’ve got to think about furnishing options for all areas, from the ceiling to the floor. Speaking of the flooring, have you thought about changing the flooring in your home or business? It’s something you might want to consider! Installing new floors could be exactly the thing you need to do in order to transform the look of your space. By making this change, you can achieve the look you’re going for without having to do much else. It can be hard to decide what kind of flooring you want to install. Should you use tile? What about wood? With all of the choices available, you might not know where to start. But, it’s always helpful to read a little about each option you have in mind. 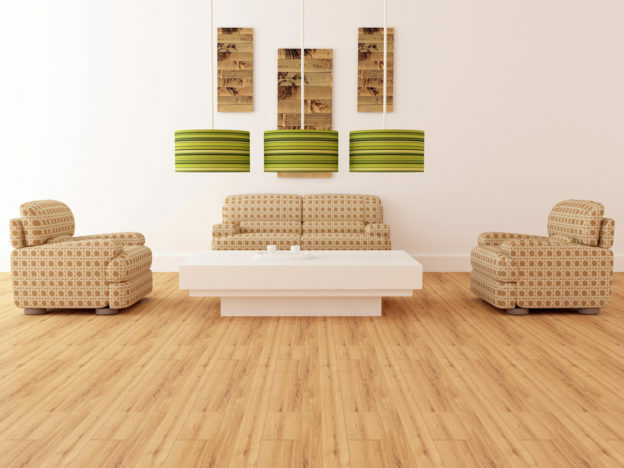 One choice you may or may not have considered is natural bamboo flooring. Let’s find out what this flooring has to offer. What is Natural Bamboo Flooring? Maybe you’ve heard of natural bamboo flooring but you aren’t quite sure what this kind of flooring really is. What’s the material like and where does it come from? Well, natural bamboo flooring is made from a bamboo plant. This plant is a part of the grass family and is native to the continent of Asia. It’s often found in China and Japan. When the tall stalks of bamboo are harvested, they’re made into strips. Then, the strips are dried in large ovens and glued together to form planks of flooring. Natural bamboo flooring is usually yellowish in color. Now, let’s take a look at some of the advantages and disadvantages of having natural bamboo flooring in your business or home. Sensitivity: Bamboo flooring is hard but it’s also somewhat sensitive. It might be best to avoid using certain vacuum cleaners. Also, some abrasive cleaners can be very harmful and damaging to natural bamboo flooring. Mopping with water can also be a bad idea when you have this kind of flooring. Water can cause the flooring to become misshapen. Moisture: Areas that are humid are definitely not ideal for natural bamboo flooring. Again, moisture can warp the bamboo flooring and it can cause it to become cracked. Other Damage: Despite the fact that natural bamboo flooring is hard, it’s susceptible to scratching and can get damaged in this way fairly easily. Durability: Some types of natural bamboo flooring is actually said to be harder and more durable than hardwood flooring. Appearance: There’s nothing like the beauty of a naturally made floor. This is definitely the case when it comes to bamboo. It can really make a space look elegant and sophisticated. Repair: We mentioned how this kind of flooring can get damaged with scratches and such. But, the good news is that those damages can be repaired with some sanding and coat reapplication! Maintenance: Although there are a lot of things you shouldn’t do when you’re trying to keep bamboo floors clean, these floors are fairly simple to maintain. With regular sweeping and dust mopping, you can keep your bamboo flooring looking great! Do you think it’s time to get some new floors installed in your business space or home? Well, DustBusters Floor Removal can make sure your current flooring gets removed quickly so that you can get going with your renovations! Just give us a call today!